Zip has been wearing her Whistle Pet Tracker for almost two weeks now, and it has been an interesting experience. This is the oldest dog wearable on the market, and the first one I've owned. Originally known as Tagg, this product finally gave dog owners the ability to track their dogs in real time. 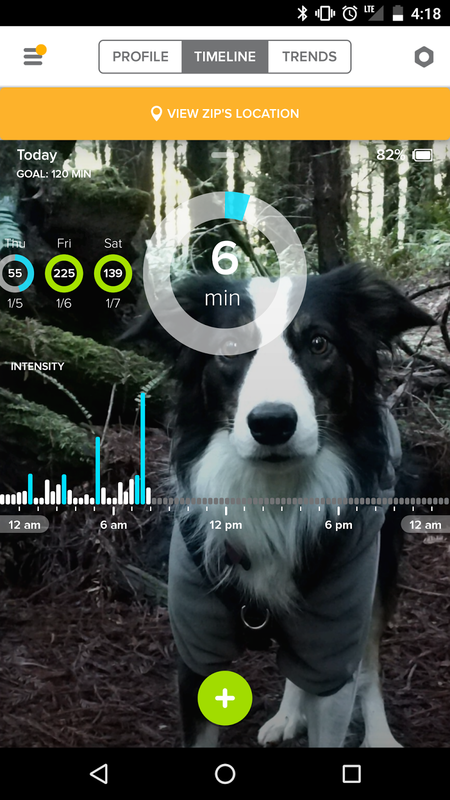 The dog wearables market has lagged a bit behind human wearables, but not by much. FitBit has been around since 2008, Tagg came out in 2011, and smartwatches didn't really take off until 2013. They're not terribly different, either. Both human and dog wearables can track activity and location, and primarily interact with your smartphone. For some reason though, most pet wearables require a monthly subscription cost. This seems weird to me, my Moto360 works without a monthly fee. I purchased my Whistle tracker on Amazon for $60. It requires a monthly fee of $10. There is a discount for buying an entire year of service, however that appears to be non-refundable according to various reviews. I am not yet certain I want to use the device for an entire year, so I am paying month-to-month. Whistle is reasonably accurate when it updates the tracker. An "Active Tracking" session only updates on her location every 3 minutes though. We've done a couple of tracking sessions on hikes with Zip running off leash, so far I've determined that the app and device could probably get me within shouting distance if she was lost. If there was some reason she couldn't come when I called, I don't know if I'd be able to find her. If she was actively running away from me, it probably wouldn't help very much at all. A dog can run pretty far in three minutes. However, when I initiate a tracking session, it inevitably reports her as being a mile away before reporting her actual location. So far I've only tried tracking Zip in places with decent cellular signal. The app has been able to find the tracker and give me Zip's approximate location within a couple of minutes. Whistle's safe zone is defined by its base station, the user can set an acre-sized or large circular Whistle Zone. The zone cannot be smaller, and the shape cannot be changed. Setting an additional zone requires an additional base station. There is no option to set a mobile safe zone, and the app does not seem to know how far my phone is from the tracker. I could change this, but currently I get an email, text message, and push notification from the app every time Zip and I leave the Whistle Zone. I get a text message and a push notification every time we return to the Whistle Zone, and it also blows up my phone every time the tracker needs charging or is fully charged, and every three minutes during a tracking session. It's great, there is no way I could possibly miss something going wrong. However, the time it takes to inform me that Zip has left the Whistle Zone varies between fifteen minutes and an hour. Again, precision is not Whistle's forte. Surprisingly, the Whistle battery has lasted several days at a time despite Zip and I spending the vast majority of our time away from the base station. The first time I had to charge it was seven days after we started using it. This was with Zip just wearing the tracker to work, though I also took a couple of days off while getting over a cold. I had to charge it again five days later, but we also had two ~20-minute active tracking sessions in that time. It seems like active tracking eats up a ton of battery. On the plus side, it only takes about two hours to go from 20% to fully charged, and it notifies me when it's getting low. On the down side, I have to take the tracker off my dog in order to charge it. This thing is kind of big and clunky, even on 36-lb Zip. It's not heavy, but it is bulky and stiff. A cat would need to wear the Whistle tracker on a harness, and there's just no way I could use it on Ru. My friends lost a Whistle tracker in a foot of water for well over an hour. It wouldn't connect to anything until it dried out, but now it works fine.